You can test the length of your post on the merit what your audience likes. The length of your business facebook timeline post may be short or may be long. It is seen that long and informative facebook posts has more footfall and the probability to read such posts increases when you add videos, images, links in the same. This doesn’t mean that short length posts don’t work. They too equally grab visitor’s attention. It is in the viewer’s discretion that tends to vary your facebook timeline post lengths. So be attentive while making your move. Selecting any size of image for your business page want help your gain visitors, on the contrary they will leave a bad impression by frustrating new visitors or regular buyers. Facebook has ideal image dimensions for profile and cover photos along with specific dimensions of images that you post on timeline for sponsored posts, banners, ads and many more. Follow facebook help center for more information on image dimensions. Remember, facebook tracks your every move on the page. Let us say that you posted a link on your page with an interesting heading to attract the visitors. Now, facebook monitors the performance of the link on your timeline on different merits like the usefulness of the link, how long visitors stay on the page linked, how many clicks goes through the link and so on. The intention is to make the content on the page more usable and more relevant to the user. In order to stay more connected, post anything that is most appropriate for your buyers. Schedule post on Sundays to get more likes, comments, shares than on other weekdays. Schedule posts on weekends they more likely to grab fair enough attention, hence do it. Vary your post timings by including all mornings, evening, nights & afternoons. By including varied post timings international audience will be benefitted due to time zone difference. Post on daily basis – this will help you stay connected and your buyers updated. Do not overwhelm your buyers with too many posts. Answer every query and reply every post from buyers. Maintain quality of the post – short & high quality post are more advisable rather than too many post. Be cautious about the facebook account you are posting from, you might want to respond from your business page account and actually responding from your personal page. Avoid multiple business page accounts; they will only confuse buyers or visitors and nothing else. 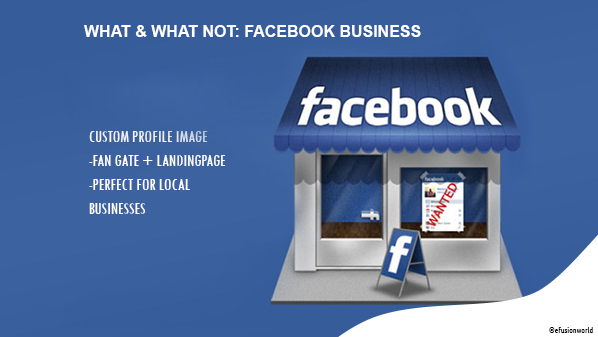 An amazing facebook business page design equally plays an important role while you are on facebook. If you are looking for more sales, more leads, more conversions, more buyers then visit us on www.efusionworld.com for social media, eCommerce & custom website solutions. You can email, call or chat live with our team of experts. This entry was posted in Facebook Social Media Page Design and tagged Custom Facebook Fan Page Design, Facebook Social Media Cover Page Design by David Cornish. Bookmark the permalink.